This time, we interviewed Dr. Nguyen Tien Luc, the Dean of the Faculty of Japanese Studies at the University of Social Sciences and Humanities, Vietnam National University - Ho Chi Minh City (also the Chairperson of the HU Vietnam Alumni Association) about his memories of his time at Hiroshima University. Dr. Luc had spent his youth in the midst of the turmoil of the Vietnam War before teaching in a university in Vietnam. After that, as reforms and liberalization were being conducted under the DoiMoi Policy（※）, Dr. Luc came to study at Hiroshima University in 1992. After he finished his studies and returned to Vietnam, he became a member of the teaching staff in the Department of Japanese Studies, USSH at Vietnam National University - Ho Chi Minh City. 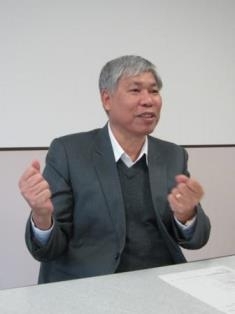 In August this year, the Department of Japanese Studies was promoted to faculty status, and he became the first Dean of the Faculty of Japanese Studies. In this interview, Dr. Luc talked about his life as a foreign student in Hiroshima University, and how this experience influenced his life afterwards . （※）DoiMoi Policy: Adopted at the 6th National Congress of the Communist Party ofVietnam in December 1986. It was the pillar of economic policy for the economic management in Vietnam. DoiMoi means ‘renovation’ in the Vietnamese language. According to this policy, Vietnam promoted the liberalization of economy such as the introduction of the market economy principles. - Firstly, please tell us briefly about yourself before you came to study in Japan. I was born in QuảngBình Province located in Central Vietnam,which is about 150km north of Hue, the ancient capital. My childhood was spent under the shadow of the Vietnam War, and I studied at an elementary schoollocated underground in a basement. I am from North Vietnam,in the area right above the Demilitarized Zone of the 17th parallel(※). American fighter planesflew above this area almost daily. Although these were not favorable circumstances,my studies were progressing well. In 1974, after graduating from high school, I headed to the Pedagogical University of Vinh located in Central Vietnam. This school, however, no longer exists under its original name after becoming part of a larger university (Vinh University). （※）the 17th parallel north: The provisional military demarcation line between North and South Vietnam established by the Geneva Accords of 1954. As the result of the Vietnam War, North and South Vietnam were reunified to the Socialist Republic of Vietnamin 1976. - What did you do after graduating from university? After graduating from university, I got a job at QuyNhon University, which is located in a port town also in the Central Vietnam area. I taught at the Department of Asian History in the Faculty of History. By that time, the Vietnam War had ended,North and South Vietnam had been unified,andthe Democratic Republic of Vietnamhad changed its name to the Socialist Republic of Vietnam. Given the close relationships with the Soviet Union and East European countries, and the strained relationships with capitalist countries,the only foreign language which I studied while at college was Russian. - Did you not study Japanese then? I think there was no faculty of Japanese studies in Vietnamat that time. However, because the economic and trade relations between Vietnam and Japan were so close, the Japanese language was taught in universities teaching foreign trade. - Had you been planning to study abroad? At that time, we had to sit in for a very difficult examination administered by the state in order to study abroad. During my years at university, I studied my hardest and managed to pass the examination. Afterwards, however, the Ministry of Education in Vietnam decided which country we would go. We did not have a choice. At first, the Ministry of Education instructed me to go study in the Soviet Union. Which, well, was natural for a student who had worked their hardest to study Russian. But, during the 80s, Vietnam and other socialist countries were falling into an economic depressionand started administering“openness” policies for political and economic reformation. The Soviet Union adopted “Perestroika” (restructuring), and Vietnam the “DoiMoi”(renovation) Policy in 1986. - Did you study abroad in the Soviet Union? My study abroad to the Soviet Union had been planned by the Ministry of Education, but it did not actually happen. - What happened after that? I was teaching Asian history, but I could not study Japanese historyat the time due to a lack of primary source materialsand documents. So, my first area of research was comparingthe histories of Thailand and those of Vietnam. In 1991,the Japanese Government restarted its financial aid to Vietnam after the war with Cambodia had ended （※）. The Ministry of Education started to select and dispatch researchers who wish to study abroad from those who had passed the state examination. Not many were selected, but I was fortunate to be one of them. （※）Japan started to offer foreign aid to Vietnam in 1959, but it was suspended when Vietnam invaded Cambodia in 1978. With the signing of the Paris Peace Agreement in October 1991, Japan resumed its support to Vietnam andbegan offering financial aid from 1992 onwards. - When was your study abroad to Japan at last set in stone? Researchers going to Japan were selected in the month October 1991, and I received a notice from the Ministry of Education in February of the following year telling me that I had been placed at Hiroshima University. I came to Japan as of April that year. - Was the state examination organized by the Ministry of Education in Vietnam? Yes, it was. Only researchers and young teaching staffs from distinguished universities can sit in for this examination. I think it is perhaps the most difficult examination in Vietnam. - Was there an interview at the Japan Embassy? After passing the examination, we had to sit in for another examination at the Japan Embassy in Hanoi. At that time, the embassy was located in quite a small building. - Before your departure, what kind of impressionsdid you have of Japan? I read from various newspapers and books that Japan had gone through a unique development. I remember feeling stunned to see the advanced,modern buildings when I came to Japan for the first time. To me, Japan was a beautiful and modern country. - When did you start learning Japanese? I did not study Japanese at all before coming to Japan. In fact, I knew very little about Japan before coming. I had seen kanji, hiragana,and katakana written on imported Japanese products, but I had little understanding of what it all meant. I only began learning Japanese after coming to Japan.It was really quite difficult. - After you were selected to come to Japan, how was it settled that you would study at Hiroshima University? I do not know of the details, but I think the Ministry of Education in Japan made the decision and noticed the university. Professor Imanaga, who was the most fluent speaker of English in the Asian History Lab, became my first academic supervisor. My first consultations with him were entirely in English. - Did you request to study history? Yes, I did. I wanted to continue majoring in Asian history studies. - Is that why you wereplaced at Hiroshima University? I have no idea how Japan’s Ministry of Education decided where I would be placed, but I had known nothing about Hiroshima University before going there. - How did you feel when you first found out that you were going to Hiroshima University? At that time, I supposed Hiroshima was more widely-known to Vietnamese people than other big cities in Japan such as Tokyo or Osaka. I believe this is because the Vietnamese people can relate, and sympathize, with the victims of the atomic bomb,given our own background and experiences in the Vietnam War. I think most Vietnamese people would feel this way. However, beyond that, I knew nothing. - When did you come to Japan? I came here on April 2nd, 1992. - How did you come to Japan from Vietnam? There was no direct flight from Vietnam to Japan. I flew to Itami Airport in Osaka from Noi Bai Airport in Hanoi via Bangkok. Kansai International Airport had not yet been built then. - Did someone meet you at Itami Airport when you arrived? I can’t remember clearly, but I think my tutor came to meet me. We gathered somewhere in Osaka for an orientation, and were divided into groups according to whether we were headed for Hiroshima, Nagoya, etc. afterwards. We took a shinkansen to Higashi Hiroshima from Osaka, and my tutor showed me the way to the university. - Was that your first time coming to Japan? Yes, it was. It was stunning to see such a beautiful and developed country. The transportation system, especially, was really efficient and convenient. It was something that would have been impossible to experience in Vietnam. - How many students from Vietnam came to study in Japan at that time? Out of 300 candidates from Vietnam, only 12 were selected. It was at the time when socialist countries had for the most part collapsed, and most of the candidates had come under a scholarship offered by the Austrian government. The 12 of us selected from Vietnam were, in fact, the first batch of Japanese Government Scholarship recipientssince Vietnam had become a socialist country. Before that, only a slight numbers of scholars who had received a recommendation directly from a Japanese university were permitted to study in Japan under this scholarship. - What was your impression of Higashi Hiroshima Campus? At that time, Hiroshima University was in the process of moving from Hiroshima City to Higashi Hiroshima Campus. Some faculties including the Faculty of Letters were still in Hiroshima City. The buildings around campus were magnificent, but there was nothing but farm houses in the surrounding areas. There were hardly any shops, either. - How were the dormitories? I stayed in the International House for 6 months and moved to the Higashi Senda Campus in Hiroshima City after that. I rented a very small apartment room there. - You must have begun yourJapanese language studies at the International Student Center at Hiroshima University. How was it? It was really tough. Japanese pronunciation is very difficult for Vietnamese people. Moreover, there are many kinds of characters, most of which I couldn’t pronounce correctly. The professors oftentimes used English during class, but to us English was also a foreign language.There were times we simply couldn’t understand. However, we did have the advantage of historically having used kanji (Chinese characters) in Vietnam. Although our understanding of kanji cannot be said to have been on the same level as those who came from China or Korea, we had an advantage over those who had come from European or South American countries.We could, at least,get the gist of the meaning of many kanji characters. - Althoughkanji is nolonger used in the Vietnamese language, did you have knowledge of kanji? Yes, I did. I could understand the meaning of most words by looking at theirkanji. - How did you spend your time in Saijo? I studied very hard every day, and even at night after returning to my dormitory. I wanted to master the language so that I could conduct research in Japanese. - After 6 months, you moved to Higashi Senda Campus in Hiroshima City in October, right? I became a research student, and in order to prepare for the entrance examination for a master’s course, I did my best to study Asian history. I started by reading basictextbooks used in Japanese junior high schools with my tutor. At the same time, I was taking intermediate Japanese lessons two to three times a week. Most of the foreign students studying with me were from China, and they were all aiming to enter graduate school. Those days, examinations in Vietnam were mainly written examinations, whereas examinations in Japan were mostly multi-choice examinations. Whether Japanese language or Japanese history exams, the format in Japan is quite different from what I had been used to seeing in Vietnam. - Did you attend classes together with Japanese students? When I was a research student, I attended classes for graduate students, too. There were many times I couldn’t understand the classes (laughter), but the professors in the Faculty of Letters were very kind and tried their best to provide me with explanations. - When you were a research student, did you also make presentations in the seminars? No, no, I couldn’t do that (laughter). I think the professors knew that, too, and did not ask me to make presentations. - Is there a professor whom you could never forget? In fact, all the professors in the Asian History Lab are unforgettable to me. I owe a lot to Professor Imanaga, who took very good care of me. My next supervisor was Professor Uemura. Most graduate students who were my seniorsat the time are now professors at various universities. They taught me a lot, and I was especially able to learn much about Chinese history from them. - How was your life in Hiroshima City? My lodging was very near to the Higashi Senda Campus, and I spent most of my time in the library and lab every day. The lab was very old but spacious. I love reading, and I studied at the library every day. - Where did you stay then? I stayed in student lodging in the town of Higashi Senda. I think it was a double-storey wooden boarding house. I could hear all kinds of sounds that my neighbors made (laughter). - Did you have any difficulties because of the differences in customs and cultures? Well, the biggest problem was not being able to understand the language completely. As for food, I didn’t have any problems because I eat basically everything. I enjoy sashimi too, which is actually my favorite Japanese food. - Did you bathe in a “sento”(public bath)? In Higashi Senda, we bathed in a sento daily. There were no bathrooms in the boarding house. At first I was shy about bathing in in front of others, but I grew used to it, and began to even like it eventually (laughter). - There are no such customs in Vietnam? - Did you have any interactions with Japanese students? Yes, I did. I became good friends with Japanese students, mostly graduate students. They understood that I couldn’t follow the lessons completely and they tried very hard to explain the details to me. I was very grateful to them. My seniors were also very intelligent people. Professor Maruta, now in the Faculty of Integrated Arts and Sciences, was a graduate student then. Also Professor Kaneko, now in the Faculty of Letters, was teaching in a university in Shimonoseki then, but he often came for study sessions at Hiroshima University. Professor Fukuzawaat Shimane University and Professor Matsushigeat Nihon University were among them too. I have learnt a lot from them. - Did you go travelling during your study abroad period? I often went to visit my Vietnamese friends and would stay in their rooms in Tokyo, Kyoto and Osaka. It was nice to see them, have meals with them, and travel around with them to various places. - How many Vietnamese students were there at Hiroshima University those days? There were not many then. During my time, there were seven of us. Six were graduate students, and one a Japanese Studies student. The numbers have increased a lot nowadays （※）. （※）In May 1994, there were 540 foreign students at Hiroshima University, and only six among those were from Vietnam. Now, out of 1,284foreign students、48 are from Vietnam （November 2015）. I remember we were busy packing the books. That’s about all. I remember I felt the new building in Saijowere narrow because the low ceilings. I preferred the buildingsat the Higashi Senda Campus, although the fact that they were old. （※）The Faculty of Letters moved to Higashi Hiroshima City from Hiroshima City in 1994. - So you started your full-scale research at the graduate school then. Did you have any unforgettable experiences or difficulties along the way? I had a hard time writing my thesis. I handed my draft to my supervisor, Professor Uemura, and he also had a hard time correcting my mistakes. The draft came back to me with red markers all over it. I was grateful to him for correcting my mistakes. But after looking at all the mistakes I made, I began to lose confidence and felt that I didn’t do well in my research. But I rewrote my draft and handed it to my professor. He returned it to me after a couple of days, and we repeated the same process again and again, probably three to four times. This is something I will never forget. I am sure it was an unforgettable experience for my professor, too, in the sense that he had to spend a lot of time correcting my mistakes! Making oral presentations about my research was another terrifying aspect about graduate school. Despite having prepared and practiced endlessly beforehand, I would become so nervous that I’dforget what I had wanted to sayduring the actual presentations (laughter). However, all the professors were kind and helpful to me,givingme guidance and comments on my presentations and my research. - How did you feel after you handed in your doctoral dissertation? I was relieved to obtain my doctorate. Unlike Japanese students who may have had the chance to give it another shot, students from Vietnam,and perhaps those from other countries such as China and Korea, felt they were failures if they were not able to obtain their doctorate before returning to their home countries. At Japanese universities those days,there was something called “Withdrawal from coursework without a degree”. But withdrawal from graduate school is considered a huge failure to most foreign students. Those days, to obtain a doctorate in Japan, especially a doctorate in a liberal arts major, was an extremely difficult task. But since the time I had come to study in Japan, the situation has started to change. - After returning to your home country, what did you do? Before coming to Japan for my study abroad, I was working at Quy Nhon University. After returning to Vietnam from Japan, however, I began teaching at the University of Social Sciences and Humanities (USSH), Vietnam National University - Ho chi Minh City (VNU-HCM) . Coincidentally, at the same time, the Department of Japanese Studies was established at USSH, Vietnam National University in Ho Chi Minh City. I taught Japanese history, international relations of Japan, and East Asian history in the Department of Japanese Studies. My research was on Japanese-Vietnamese relations, and I specialized in the modern period. - At that time, how many teachers were there in the Department of Japan Studies? Very few. There weren’t many specialists available then. I would frequently organize study sessions with the younger teachers. - In 1999 when you returned to your country, were there many Vietnamese students interested in studying about Japan? The number of students definitely increased. Japanese industries were in the midst of an investment boom in Vietnam, and they lacked Vietnamese staff who could speak Japanese. - After teaching in the Department of Japanese Studies all these years, do you see any changes in students nowadays compared to students before? Students now a days are much more informed about Japan before their entry into the Department of Japanese Studies. Some students even studied Japanese while they were in high school. The situation today is very different from what the students of my generation, or the students from when I had first come back to Vietnam in the late 90s, had experienced. Youngsters nowadays know a lot about Japanese manga, and animation, too. -I have joined the school festival in the Department of Japanese Studies. I was surprised to see so many students interested in Japan. It sure is something to be glad about, don’t you think? It sure is. High school students entering the Department of Japanese Studies are all brilliant students. The Department of Japanese Studies is quite a very popular department, and those who enter it are specially selected, bright students. So teaching them is a very easygoing job for me because they are so diligent in their studies (laughter). - Looking back at your study abroad experiencesin Hiroshima, do you have any final words? Studying abroad changed my life. 7 years is a long time, and after having acquired a sufficient amount of knowledge in Japan, I managed to find a good job once returning to Vietnam. I am very glad to be able to teach many students all that I have learned about Japan. After coming back to Vietnam, I have stayed in close contact with the professors of Hiroshima University. We even established an association for alumni of Japan study abroad programs in Ho Chi Minh City, and I was fortunate to head this association for its first three years. I was impressed by Dr. Luc’s words, especially when he said that studying abroad in Hiroshima University changed his life and that he is glad to be able to teach his many students about Japan to this day. Dr. Luc had done his best to study in the midst of turmoil in his home country and eventually became a teaching staff after graduating from university. He gained the opportunity to study abroad in Japan, and studied history at Hiroshima University. 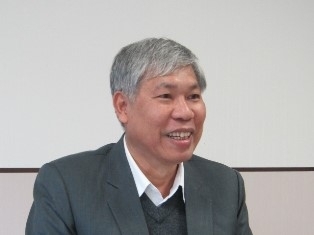 After returning to his home country, he became a teaching staff at the University of Social Sciences and Humanities, Vietnam National University - Ho Chi Minh City, educating students in the Department of Japanese Studies. We hope that one day the students there will act as a bridge, helping connect Japan and Vietnam and promoting friendship and exchange between these two countries, just like Dr. Luc.